Following on the success of its sold-out Girls and Coding workshop in November, the Sunshine Coast Tech Hub and Capilano University are hosting a second coding workshop for girls aged eight to 12 led by women who work in the tech sector. Lisa Bains, a web developer who taught at the fall workshop, points out that the tech industry is predominantly male. “Fewer women choose careers in tech, and we know the decision to avoid the sciences happens at a young age,” Bains said. 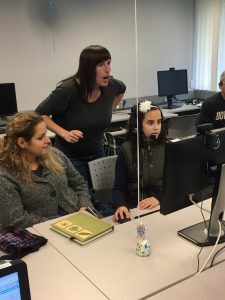 It was National Girls Learning Code Day and two dozen girls aged 8 to 12, were concentrating on the task Nov. 12 at Capilano University in Sechelt. Writing code refers to creating the sequence of instructions that gets a computer to perform a task, and it is a job that has been dominated by males. In this case, the girls used a programming language called Scratch, with help from volunteers who work in the tech industry. Saturday, Nov. 12 is National Girls Learning Code Day, and local community partners have come together to help girls start coding, and help the community explore the gender gap in the tech sector. The first event, a Girls Learning to Code workshop, is a fun hands-on introduction to code for girls aged 8 to 12 using Scratch (www.scratch.mit.edu), an internationally acclaimed easy programming language for kids. The workshop will be held in Capilano University’s computer lab, so registrants do not need their own equipment.